The end of production wasn’t the end of the road for iconic fashion label Easton Pearson. To preserve and celebrate the brand’s incredible legacy, Museum of Brisbane is preparing to unveil the first major exhibition from the extensive Easton Pearson archive. This is fashion as art; distinctly Brisbane style. The Designers’ Guide: Easton Pearson Archive is about to give you a unique glimpse inside the inner workings of two forward-thinking custodians of Australian fashion: Pamela Easton and Lydia Pearson. The internationally acclaimed Brisbane designers worked with the museum to handpick more than 200 garments from the 3300-strong collection, together with sketches, accessories, samples, lookbooks, photographs, interviews and anecdotes – all of which paint a rich picture of technical innovations and daring creativity. “Their unique approach referenced art, travel, film, literature and music to create a bold aesthetic characterised by daring patterns, innovative materials, meticulous techniques and a sustainable ethos,” says Museum of Brisbane Director Renai Grace. The exhibition’s pieces come from the museum’s famed Easton Pearson Archive, which is the largest collection from a single Australian fashion house held by a public art gallery or museum. The women who introduced your wardrobe to those raffia and champagne bottle top embellishments will share the stories behind their label too – the highs and lows, the collaborations, the design processes and the bold leaps of faith. Their aesthetic wasn’t the only forward-thinking statement made by Easton Pearson. The exhibition also takes a look at the role Easton Pearson played in the slow fashion and ethical manufacture movement to achieve good conditions, fair pay and respectful relationships with all involved in the manufacturing process. Themes such as slow fashion, sustainability, design practice and experimental future fashion will all underpin the exhibition’s accompanying public programs. Running concurrently until late January, Dress Code will continue the museum’s sartorial summer line-up. The free exhibition examines how fashion acts as a material embodiment of culture, gender and historical identity, featuring artists Gerwyn Davies, Hannah Gartside, Lisa Hilli, Grace Lillian Lee and Emily McGuire. 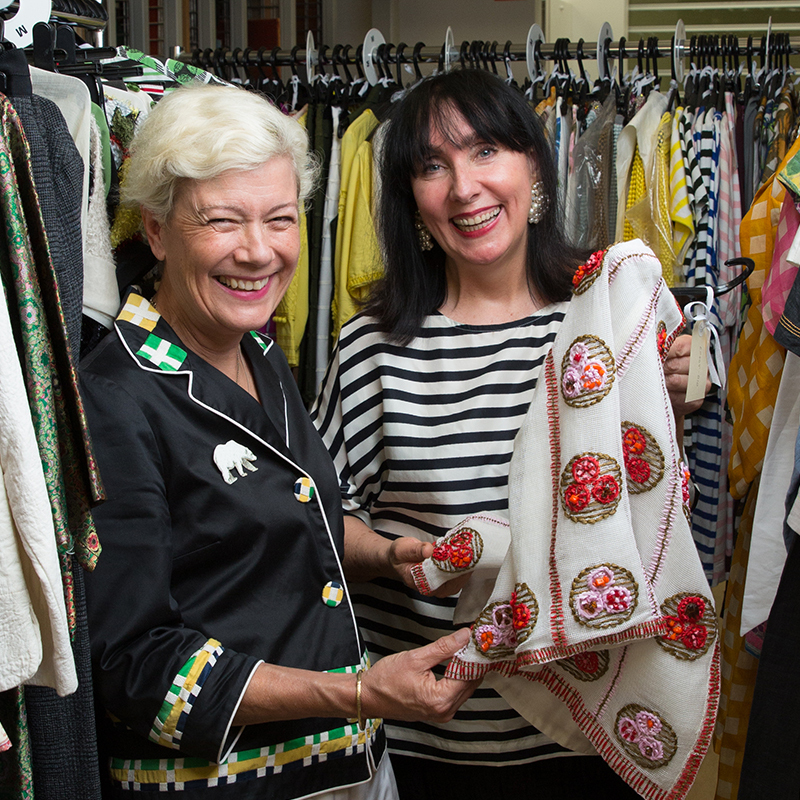 Pictured: Designers Lydia Pearson and Pamela Easton with a selection of garments from the Easton Pearson Archive. Photo: David Kelly.